UCF engineering students set out to change the world with Limbitless Solutions. Growing up in Tarpon Springs, Florida, Albert Manero was taught the importance of community citizenship. 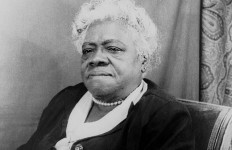 “I learned to give back. I was raised that way by my parents. I was made aware that we should always be trying to make a difference,” he recalls. His dreams are indeed coming true, along with those of his team of senior design students, and all are rooted at UCF. Manero and his team are proving that an engineering education can lead to life-changing innovations, and ultimately entrepreneurial success, with the help of a continuum of campus resources. Prior to graduating from UCF with a master’s degree in Spring 2014, Manero was already well on his way toward making a difference. 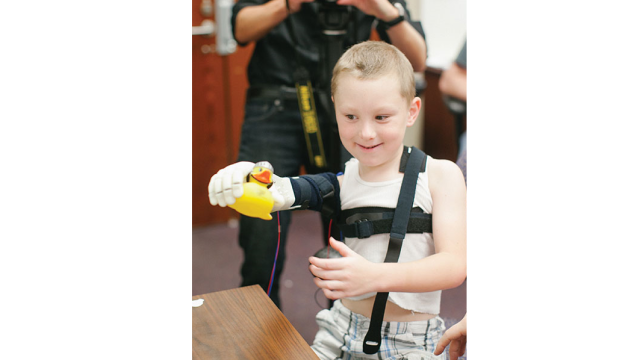 Along with a team of fellow students, he began working on a prototype that would lead to a Florida 6-year-old gaining use of an arm. Last July, Alex Pring hugged his mother for the first time, thanks to a bionic arm students designed and manufactured in the UCF Maker Space Labs at the College of Engineering and Computer Science. Created on a 3-D printer and operated with off-the-shelf servos and batteries activated by the electromyography muscle energy on Pring’s bicep, the arm’s cost was less than $350. 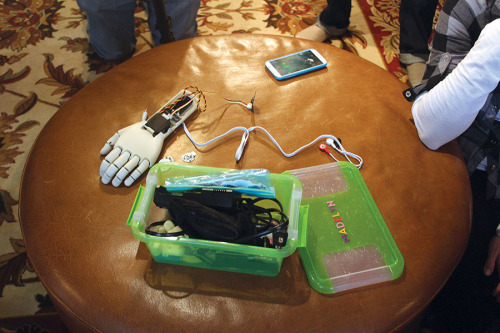 Alex Pring of Groveland received a bionic arm from a team of UCF engineering students at a cost of about $350, using a 3-D printer, simple materials and wondrous innovation. The team is continuing to work with Pring to enhance his physical capabilities. 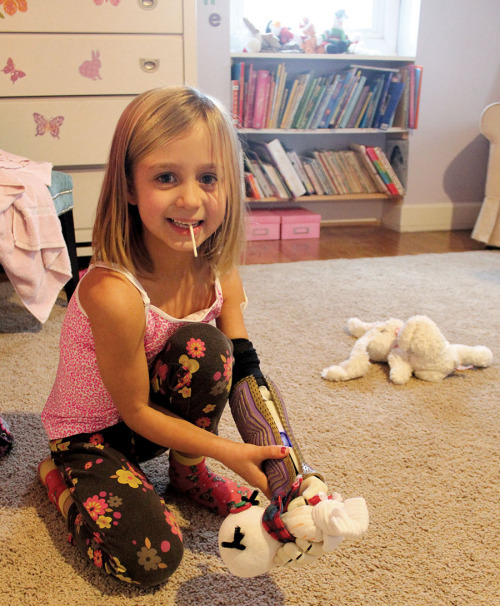 Children’s prosthetic limbs are especially difficult to make because of the need to miniaturize components. Additionally, most insurance companies won’t pay for prosthetics because they need to be replaced often as a child grows. Undeterred, Manero and his team made it happen, and their success continued. Just before Thanksgiving, 7-year-old Madelyn Rebsamen from Virginia received a present — a new bionic hand from the Limbitless Solutions Foundation, an organization founded by Manero and other UCF engineering students. The hand was the first of its kind, specially designed to include part of a forearm. Students spent their spare time and their own money on the project. Manero — a Fulbright scholar who is currently working for the German Aerospace Center and scheduled to receive his Ph.D. from UCF in Fall 2016 — is out to change the world. “When you can get people to dream big things, then you have a real chance of changing the world,” he says. Madelyn Rebsamen’s new “helper hand” is the latest effort by the Limbitless Solutions Foundation but likely not the last. The foundation is actively seeking other partnerships and projects. Now in typical fashion at UCF — or, perhaps more aptly, in prototypical fashion — entrepreneurship beckons. Limbitless Solutions is seeking ways to solve other problems, and discussions continue with colleges across the country to expand production of 3-D printed bionics. All of this is part of UCF’s holistic approach to student entrepreneurship — from innovation to commercialization — that is headquartered at the UCF Center for Innovation and Entrepreneurship (CIE). CIE consolidates and coordinates major innovation and entrepreneurship support activities, with the goal of leveraging university and regional partnerships to create an effective entrepreneurial support infrastructure. Across campus there are lab and maker spaces, mentorship and guidance, assistance with funding and business incubators, business plan competitions and events, programs to develop technology spinouts, and a wealth of assistance as enterprises grow and spread their wings. Or in the case of the UCF-born Limbitless Solutions Foundation, spread their arms and hands. 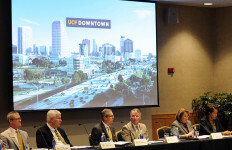 UCF plans to debut its I-Corps program in a big way. Jerome “Jerry” Engel, Ph.D. — co-founder and leader of the Lean Startup movement — will make special appearances at the UCF campus and at a community mixer downtown, in partnership with Canvs and Starter Studio, to help officially kick-off the UCF I-Corps program. UCF I-Corps — administered by the UCF Center for Innovation and Entrepreneurship (UCF CIE) — is a statewide program designed to foster, grow and nurture an innovation ecosystem through partnerships between the National Science Foundation, Florida universities, and venture capital and entrepreneurial communities. Central Florida is poised to become the epicenter of the Lean Startup movement in Florida. This hands-on methodology emphasizes engagement and experiential study. The approach requires teams of researchers and students to propose and test their business hypotheses in “real-world” scenarios. Industry mentors review findings with students, helping them make appropriate adjustments to their innovation and/or commercialization plan in preparation for bringing their ideas to market. Ivan Garibay, Ph.D., serves as Program Director for UCF I-Corps. 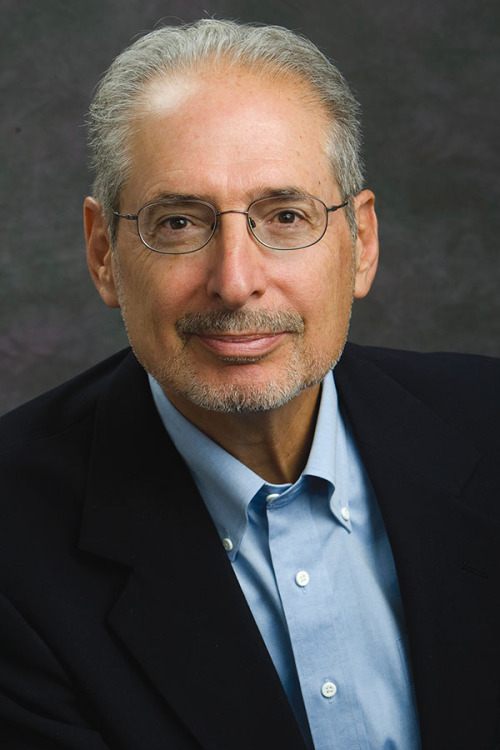 Engel collaborated closely with Steve Blank, chief architect of the Lean LaunchPad method, to help develop the curriculum and co-author the LaunchPad Educators Guide. Engel is a leader in entrepreneurship education, venture capital, corporate innovation and regional economic development. He joined the University of California at Berkeley in 1991 and founded the Lester Center for Entrepreneurship. As an adjunct professor at the Haas School of Business he has instructed in both the School’s MBA and Executive Education programs specializing in Entrepreneurship, New Venture Finance, Corporate Innovation, and Venture Capital. He has taught the Lean LaunchPad at U.C. 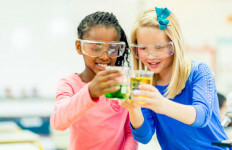 Berkeley and across the U.S. as National Faculty Director of the National Science Foundation’s I-Corps program, which has trained over 300 teams of the nation’s leading scientists. Internationally he is supervising programs in Asia and Europe. Editor’s note: For more information, visit: icorps.cie.ucf.edu or contact Ivan Garibay (ivan.garibay@ucf.edu or 407-882-1163).